What Does the Idiom White Elephant Sale Mean and How did it Originate? A white elephant is an idiom for a valuable possession which its owner cannot get rid of, and whose cost of ownership is way more than what it’s worth. The origin of the phrase white elephant came from the fact that albino elephants are quite rare. Legend has it that in Thailand, the white elephant was considered such a find that only the king himself could own one, and no white elephant was to be traded or killed without the consent of his Royal Highness. As you can imagine, however, the upkeep of an elephant isn’t easy, and the cost of feeding can run up a pretty steep bill at the local farmers’ market. Therefore, the story goes, the Thai king would reserve the white elephant as a gift for only those “friends” he most wanted to get even with. The receiver of such a gift would be initially pleased with the gift, but it wouldn’t take long before he was financially ruined as he tried to maintain the giant animal. Whether the origin of the phrase is accurate or not, this is exactly what ended up happening to King Charles I of England. 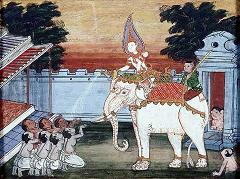 He was presented with an albino elephant from Siam. It being a time when the British king was trying to raise funds, the expense became overwhelming, and Charles suffered great hardship. His wife even had to forfeit her annual trip to Bath that year. The tradition of keeping white elephants came from stories which associate a white elephant with the birth of Buddha. Buddha’s mother was said to have a dream of a white elephant presenting her with a lotus flower, a symbol of wisdom and purity, on the eve of giving birth. An example of a white elephant is the “Spruce Goose” aircraft designed by Howard Hughes. It was called a “plywood white elephant” by Hughes’ associate Noah Dietrich. What a Royal Pain elephants are. Where does the idiom “white elephant” come from and What does it mean? Why Did Ganesha Have an Elephant Head In Hindu Mythology and What Does the Elephant Symbolize? How Did the Expression “White Elephant” Originate and What Does the Term Mean?